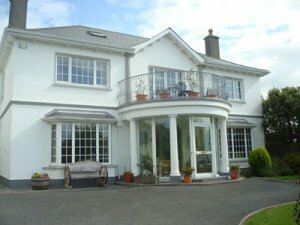 Summerville Guesthouse Bed and Breakfast is a spacious, elevated residence with spectacular views of Galway Bay. This is the ideal location to rest your head at night, whether you are planning a city break or hoping to explore the West coast. Free on site parking is available for guests traveling by car. The rooms at the Summerville Guesthouse Bed and Breakfast are tastefully decorated. All rooms are en-suite. Each room come equipped with Cable TV, Hairdryer in room, King Size Bed, Free Wirelass Broadband, Iron and ironing board and Central Heating. Breakfast is served each morning in the guesthouse. Guests can choose from Traditional Irish (Grilled Bacon, Irish Pork Sausage, Fried Egg, Tomato, Mushrooms & Hash Browns), Vegetarian (Grilled Vegetarian Sausages, Fried Egg, Tomato, Mushrooms & Beans), Scrambled eggs or French toast. Freshly brewed tea or coffee accompanies all breakfasts. Galway City is nearby and provides guests with a wide range of cafés, diners, restaurants and pubs where they will find cuisine of all styles to suit all tastes. The Summerville Guesthouse Bed and Breakfast is close to Salthill and just a short drive from Galway City. The sleepy fishing Village of Barna is 1KM to the west. . The Summerville Guesthouse is an ideal base for exploring Ireland’s West Coast. It is within easy reach of Connemara, Clifden, and the ferry to the famous Aran Islands.